On Thursday, March 21, 2019, at approximately 2:00 p.m., detectives assigned to the Gang Crimes Team and the Property Crimes Investigations Teams went to an address in the 600 block of Trowbridge Street to follow-up on several property theft related cases and to conduct a probation search. This same residence was the subject of numerous neighborhood complaints. When detectives and officers arrived at the residence, they were aided by the Sonoma County Sheriff’s Office helicopter, Henry-1. Detectives and officers immediately contacted several subjects in the front and side yard moving and loading items in different vehicles. Nine subjects were contacted, including several small children. During the probation search, detectives learned the residence had been converted and modified to accommodate additional living quarters in the garage and backyard patio. There was also an extremely dilapidated motorhome on the side yard where subjects were living and using illegal narcotics. Further, the residence did not have running water. Because of the health and safety concerns on the property, the city Code Enforcement Department was contacted and responded to the residence. Code Enforcement explained the violations and concerns to the tenants. As a result of the follow-up investigation and probation search, Kathryn Marie Roman was arrested. Roman is 37-years-old and resides at the residence. Roman had four warrants for her arrests, two were felonies and two were misdemeanors. The warrants were all theft related. Johnny Ramon Perez was arrested for PC 3452 – Violation of Post Release Community Supervision, HS 11377(a) – Possession of Controlled Substance, and HS 11364(a) – Possession of Drug Paraphernalia. Perez is 32-years-old and a Santa Rosa resident. As detectives were conducting the probation search, Jason Isaiah Lopez walked toward the residence. Lopez was contacted by another detective in the area before reaching the residence. Lopez was in possession of a loaded and concealed semi-automatic firearm in his waist band. Lopez was arrested for PC 25850(c)(6) – Possession of a Loaded Firearm Not by the Registered Owner, PC 25400 (a)(2) – Carrying a Concealed Weapon on Person, and PC 29805 – Prohibited Person Possessing a Firearm. 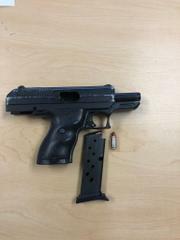 See attached picture of firearm. Lopez is 20-years-old and resides at the residence. Lopez is also known to be an active gang participant. Roman, Perez and Lopez were all arrested and booked into the Sonoma County Main Adult Detention Facility. The Santa Rosa Police Department would like to thank Henry 1 for their assistance. department at (707) 528-5222. Completely confidential and anonymous messages about gang activity can be left at 707-543-GANG (4264). For media inquiries, please contact Sergeant Tommy Isachsen at (707) 543-3627 or at tisachsen@srcity.org.